WinDbg. From A to Z! A simple application that implements several common debug situations and scenarios. CrashMe is a simple application that implements several common debug situations and scenarios. As such it is a great help for both; your first steps with WinDbg or if you ever need to reproduce a particular crash within a test environment. Take a look at the screen-shot bellow or simply download it to get a hint of what we are talking about. Note: If you have an interesting situation that CrashMe doesn't cover please drop us a line or send us your code. Other CrashMe fans might be thankful for your contribution. All the power and flexibility of the Microsoft Debugging Tools package can be diminished by its complexity and learning curve. After all, it is very easy and comfortable to work with the Visual Studio debugger once you begin to use it. Those who advocate the use of a unified tool that does everything, like a cell phone, make the case even worse. However, when the competitive advantage of one tool over another is obvious, there is nothing worse than getting stuck in a situation which is suboptimal for you. As I was thinking about this difficulty I found a presentation written by Robert Kuster that explains all the important details of debugging with WinDbg for novice and experienced programmers. The presentation "WinDbg. From A to Z!" turns out to be just as useful as WinDbg itself because it explains everything from simple things that you should know right away such as setting up symbols and the theory of command types in WinDbg, to the advanced topics such as remote debugging. 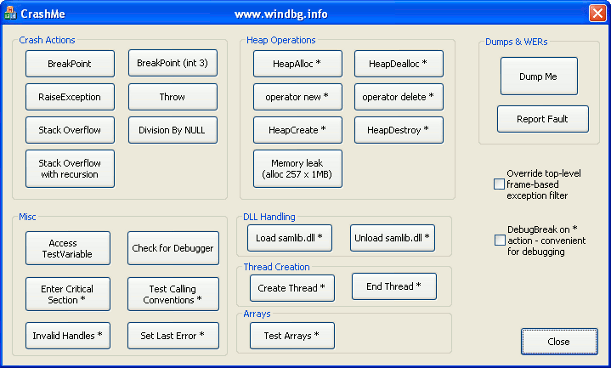 In the end there are two important tips for those who wish to explore the debugging world in more detail: read WinDbg's documentation (which is also great, although much more extensive) and learn assembly (simply essential if you want to solve a variety of problems). If you never took the time for advanced debugging on Windows think about it again. It could take you 2 hours (divide this into 15 minute periods per day!) to read this great tutorial. As a result you might surprisingly end up with an exponentially reduced troubleshooting time for your debug situations.